The system can be used when the following conditions are met. • The lane you are driving has detectable lane markers on both sides, and your vehicle is in the center of the lane. • The vehicle speed is between 45 – 90 mph (72 – 145 km/h). • You are driving on a straight or slightly curved road. • The brake pedal is not depressed. • The wipers are not in continuous operation. 1. Press the MAIN button. - The LKAS is on in the multi-information display. The system is ready to use. 2. 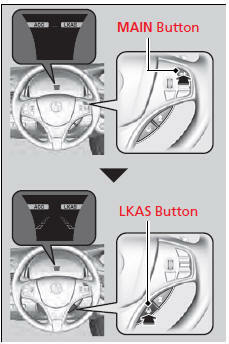 Press the LKAS button. - Lane outlines appear on the multiinformation display. • Shadows of adjacent objects are parallel to lane markings. • The windshield is dirty. • Where the roadway has crossing or other lines (e.g., such as at an intersection). windshield that could obstruct the LKAS camera’s field of vision. Scratches, nicks, and other damage to the windshield within the LKAS camera’s field of vision can cause the system to operate abnormally. If this occurs, we recommend that you replace the windshield with a genuine Acura replacement windshield. Making even minor repairs within the camera’s field of vision or installing an aftermarket replacement windshield may also cause the system to operate abnormally. After replacing the windshield, have a dealer recalibrate the camera. Proper calibration of the LKAS camera is necessary for the system to operate properly. If the Can Not Operate: Camera Too Hot message appears: • Use the climate control system to cool down the interior and, if necessary, the defroster mode when windows are fogged. • Start driving the vehicle to lower the windshield temperature, which cools down the area around the LKAS camera. If the vehicle drifts toward either left or right lane line due to the system applying torque, turn off the LKAS and have your vehicle checked by a dealer. 3. Keep your vehicle near the center of the lane while driving. - The dotted outer lines change to solid ones once the system starts operating after detecting the left and right lane markings. The LKAS temporarily deactivates when it fails to detect lane lines. When the system detects the lines again, it comes back on automatically.